I seem to be stuck on foxes these days! By coincidence, karma, good luck or just a unique blessing from God, I have had an opportunity to see and photograph my very own "foxy" friend. 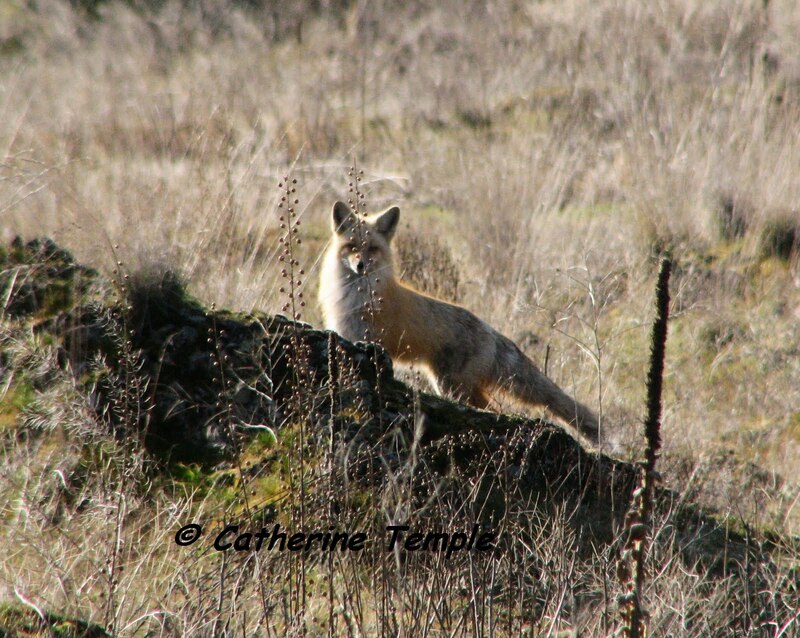 The last two mornings while on my walk in a habitat area near my home I have been treated with a glimpse of this red fox. Yesterday, I saw it ever so briefly as it crossed the road and disappeared into some rocks. This morning it seemed to be playing a game of hide and seek with me. I was actually surprised to see it there again, but this time it stopped long enough to get a good look at it through my binos AND snap two photos before it trotted off. A few moments later I saw it again sitting on a rocky outcropping back lit by the morning sun looking like it was just waiting for me to see it posed that way. Beautiful! As soon as I spotted it, off it trotted again beckoning me to follow. Of course, I did, but it had slipped into some rocks again and I lost it. 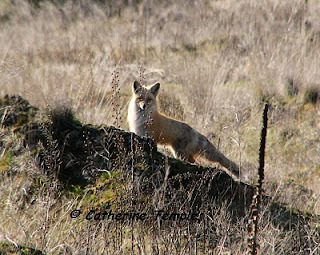 Siting this fox was a first for me. I have seen them in captivity, studied them through taxidermy mounts, and most recently through the photos of my friend and client, Nancy Sattler. I have never had the opportunity to see one in the wild. This was exciting and even more so because I have just finished these two red fox paintings. And because this one appeared to be as curious about me as I was about him/her. I hope I get a chance to see this one again. 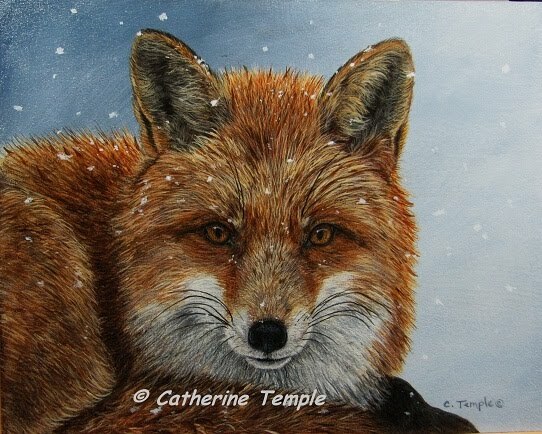 The images that it presented me with this morning certainly give me ideas for yet another fox painting. It made my morning to see it there in the early sunrise. Perhaps it will make your day as well. Enjoy! Finally! It seems like it's been forever since I've posted though I guess it's only been a few weeks. I have been waiting because my camera has been in for repairs and I couldn't photograph any of my artwork or anything else for that matter! I felt like I lost an appendage while I was without it. That camera goes almost everywhere with me so I can record not only the art I create, but the reference material to create it. And while I could have gone into debt to buy the camera of my dreams to replace it, I chose instead to fix this one first then save for the next one. Probably a much wiser choice in the long run. I learned a few things while I was waiting for my trusty camera to return. One was patience....which I didn't learn very well (it's an ongoing process!). The other very valuable thing I learned was the art of observing and sketching from nature. Now, you would think that, as an artist, I already knew these things and had them down. Well, I thought so, too, but then my camera croaked and I suddenly discovered I had actually gotten a little lazy and was relying on technology way too much. Being without this item forced me to go back to basics, take my sketch book out with me and try to record what I saw by drawing it on location. WOW! What a concept! This turned out to be a very valuable, if not challenging lesson. And it also was very freeing. I felt like a kid again, wandering around the fields where I grew up, sitting and really looking at an object, studying it and with my little sketch book recording what I saw. It's definitely a challenge when you're trying to sketch an illusive screech owl hiding in a nest box while looking through binoculars (without your glasses because you can't see through the binos with them) then trying to put the glasses back on so you can see through your bifocals to draw, while kneeling down to balance your sketch book and fighting off a wet dog who thinks it's time to play because you're on her level! Not stuff I had to deal with while recording the owl with my camera, BUT a lot more fun and makes a good story! Amazingly, I was able to do two VERY quick sketches and recorded the moment with more feeling than the camera ever could capture because the pencil strokes were more "expressive" than a digital image. They were MY pencil strokes made with excitement! So what does all this have to do with this latest painting? Nothing really, it just shows that no matter how good you think you are or how far you've come there's always room for improvement and that it's good to be reminded of the things that are important. Simple, basic things that make us slow down and look at the world a little closer and help us to connect on a more personal level. Humbling.